Bruce Wayne and Diana Prince must gather a team of people with superpowers in order to stop Steppenwolf from using the three 'mother boxes' to transform Earth into an environment closer to that of his home planet, which will destroy Earth and of its inhabitants in the process. It's hard to believe we are now on the fifth film in the DC extended universe. Of the previous four entries, it is really only "Wonder Woman" that has given us hope for the future of the franchise. "Man of Steel" was okay, but it was a bit too dull and didn't quite capture the spirit of the character. "Batman v. Superman: Dawn of Justice" was too bleak and convoluted. "Suicide Squad" is a movie that is better not discussed, and "Wonder Woman" was, well, wonderful. The question for "Justice League" is where will director Zack Snyder's latest entry in the DCEU fall? For us, it doesn't quite reach "Wonder Woman" levels, but it is definitely a lot more fun and much more entertaining than "Man of Steel," "BvS," and "Suicide Squad." 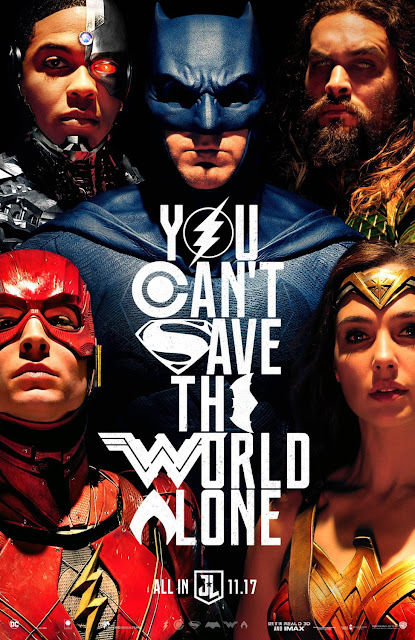 This film teams up Batman (Ben Affleck), Wonder Woman (Gal Gadot), Cyborg (Ray Fisher), The Flash (Ezra Miller), and Aquaman (Jason Momoa) to take on an invading alien army led by Steppenwolf (Ciarán Hinds), a very powerful God-like entity. He wants to obtain three objects called 'Martha boxes,' oops, we mean 'mother boxes,' which when combined possess the power to transform Earth into a planet similar to that of Steppenwolf's homeworld. Of course, this will destroy the earth and all of its inhabitants, but that sort of thing doesn't seem to bother Steppenwolf very much. It will take the entire Justice League combining their powers and risking their lives to defeat him. Past problems with other DCEU pictures include overly messy plots and massive lack of focus, which have often caused pacing predicaments. This film, however, may actually be a bit too simple, and as a result, the villain is left underdeveloped. Underdeveloped and mostly disposable villains are a problem in many comic book movies in general. That being said, "Justice League" is more about the heroes and finding a reason for them to come together. Steppenwolf and the 'Martha boxes' simply facilitate this happening. This movie is definitely flawed. The CGI is too busy and too chaotic at times, the dialogue is sometimes overly cheesy, it's a bit tonally inconsistent, and some of the jokes don't land. However, "Justice League" is still a ridiculously fun movie despite all of its problems. It is an exciting ride and we never found ourselves bored or annoyed at what we were watching. We really like the way the cast works together as a group. The highlight of the film for us is Ezra Miller's The Flash, who had us laughing time and time again and really got us invested in him as an integral part of the team. Jason Momoa is also an excellent new addition and he fits the part of Aquaman very well. His beefcake stature and rugged, tattooed appearance help make an often mocked character really badass. We can't wait for his solo movie. As for Ray Fisher, he is good as Cyborg, but his character is mostly relegated to delivering exposition. Luckily, he is a key element to the overall story, and we enjoyed his performance and hope to see more of his character in the future. Gal Gadot is still as charming as ever as Wonder Woman/Diana Prince and continues to be an awesome beacon of hope and righteousness. Ben Affleck is an entirely different story. Though he played the part of an aging Batman very well in "BvS," it is apparent that he doesn't want to be involved in this role any longer, and this painfully comes through on screen. We don't think we'll be seeing much more of Batfleck in the DCEU. In the end, despite its flaws, we enjoyed "Justice League." We will admit, we had all but given up on this incarnation of our beloved DC heroes and villains, so we're glad we enjoyed this film. We think it is definitely worth watching on the big screen and is a major step in the right direction for the DCEU. We left the theater excited for the future of this universe and look forward to seeing what's to come (although we won't necessarily be angry if Zack Snyder decided to step down).